Goal conversion rate is one of the most popular Arc features that we’ve ever released. But we struggled on how to include it in our summaries without over complicating things. It wasn’t until we improved our weekly and monthly summaries that we found a way to seamlessly add conversions! After we started including goal conversion rates we saw a clear jump in sign ups and teams upgrading to our paid plan. Not surprising, since we knew conversions were going to make a big impact. What did surprise us was how many e-commerce companies were upgrading! Some of those new users started to reach out asking about e-commerce conversion rates. They loved getting goal conversion rates, since it gave them a high-level view of how their entire site was performing, but they also wanted the specifics about their e-commerce business. We started a small beta group and released e-commerce conversion rates. After a few rounds of feedback, we had a solution that our users loved. The tricky thing about e-commerce in Google Analytics is that it’s disabled out-of-the-box. Unlike goal-based conversion rates, which are easily available, e-commerce needs a special script added your website in order to enable it. This means most teams don’t care about e-commerce, but it’s really important for the teams that do. Arc’s mission is make Google Analytics simple. That means we only display the information that’s key to your business. Since not everyone cares about e-commerce conversions we put a few rules in place to keep things clean. 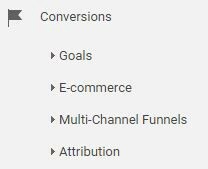 If you’ve upgraded to our Paid Plan and use Google Analytics e-commerce, Arc will now display your e-commerce conversion rates. If you don’t, Arc won’t include it. I say this a lot, but we take feedback super seriously! We’ve even created a beta group to test our new features before we release them publicly! Reach out with questions or suggestions and ask about the beta group. We’d love to have you! Email hello@arc.ai or use the /arc-feedback command inside slack! Originally published at blog.unioncode.com on December 10, 2016.